Do more of what works. Stop doing what isn’t working. You don’t. It’s a crap shoot. Sometimes you get a face full of crap. Sometimes you don’t. You’ll know it when you feel it. This much I know – sometimes it’s best to not even try to figure it out. Sometimes it’s just best to stop doing what you’re doing because deep down inside you know it’s not working. Who cares why? Just stop it so you can start something else. Something new. No guarantees the new thing will work either, but at least it’s a change. Maybe for the better. You won’t know until you try. You should consider rebranding or renaming, or both, when you really feel you have given the effort to get some traction – some real sign of success – and it’s just not happening. What’s success? Depends on what you’re chasing. Maybe it’s customers, clients or patrons. Maybe it’s revenues. Maybe it’s exposure or attention represented in attracting a crowd or audience. It can be all sorts of things. You’ve got to decide what it is for you. Here’s the thing. You know if you’re achieving success or not. And you know if things are on the uptick or not. If not, my advice is quit. Give up. Stop doing what you’re doing. That’s been my lifelong mantra, but I break it all the time. Like so many little ditties, it sounds wise, doesn’t it? And it is. Sometimes. But not all the time. One of these days I’ll do a show on my ever growing list of things that sound smart, but aren’t. I can come up with such statements as good as the next guy. Maybe better than most. Hence, the statement, “I may quit, but not today.” My wit and witticisms know no bounds of stupidity. But today is the day. I mean, you can’t avoid quitting forever. One day has to be the faithful day that you actually do quit. Because it’s likely past time. Truth be told, you should have quit a long time ago, but you were afraid. You listened to all the pundits tell you how powerful courage, resilience and persistence are. And you believed it. Dumb you. Well, not really. We all believe it. Or we want to. Deep down inside you questioned it though, didn’t you? You kept wondering if it might be a mistake to keep slogging on. You listened to social media. You read all the cool books. You followed all the popular blogs. There’s that collective wisdom that captured your imagination and seemed to be so right. Seth Godin’s Dip resonated with you. Then there are all the stories of people who persisted through thick and thin making you feel like a real loser if you quit now. But you really know it’s time to quit. It’s hard, but reality slams you to the ground with a sobering force. Sometimes The Signs Are Clear. Sometimes They’re Anything But. When a store closes there are clear signals. They’ve likely been present for awhile, depending on the financial fortitude of the owners. Here in Dallas/Ft. Worth there’s a retailer that has been struggling for ions, Radio Shack. Their financial fortitude seems surpassed only by their refusal to face reality. Public money has a way to prolonging the agony of quitting. The inability to pay invoices, meet payroll, make lease payments and other signs are pretty strong indicators that the present course isn’t working. 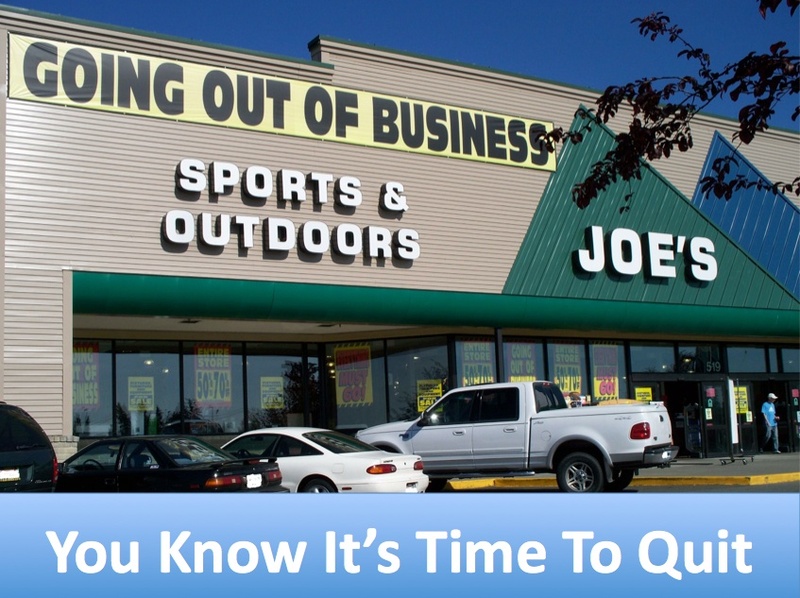 Brick and mortar businesses don’t usually just up and quit because they suddenly decided to. Instead, they’ve likely wrestled with months or years of bad numbers, low performance indicators and various other warning buzzers telling them they’re sinking. Like a captain of a sinking ship, it can be difficult to make the decision to give up all hope. Your endeavor may be struggling. Maybe it’s always struggled. Or maybe it was once thriving, but no more. Or maybe it just never got off the ground. If you had a thousand bucks for every hour you’ve spent soul searching, you’d have well over 100 grand. But the soul searching has left you feeling empty and alone. The war in your head grows more intense as you feel the pressure to do something differently. Anything. ‘Cause this ain’t workin’ – at least not any more. If only there was a clear signal that said, “This is NEVER going to work.” But the dashboard of our life sometimes lacks the gauges we need most. If only we had a CHECK ENGINE light to alert us to something potentially catastrophic. Instead, we’re left to figure it out on our own. And that’s the real work. Figuring it out. For ourselves. Quitting Isn’t Losing. It’s An Opportunity To Stop Losing. For years, as an executive in the consumer electronics business I attended the Consumer Electronic Shows in Las Vegas. I don’t gamble, but I’ve watched others do it. Sometimes poorly. Well, that was too curious for my blood so I found a seat within eyeshot of the table and waited. Thankfully, it wasn’t too long – maybe 20 minutes or so – and in walked a sharply dressed man, alone. He approached the table and out of nowhere appeared another casino employee with a full rack of chips. The man took the rack and began to play a pattern of numbers. The game was roulette. The “dealer” spun the wheel and in one fell swoop he gathered up all the chips. The house won that round. The player repeated the process, appearing to play the exact same numbers and colors. Again, the wheel spun. Again, the house won. A third time. Again, the same outcome and the entire rack of chips was vanquished. Without saying a word the player exited the casino. I followed at a safe distance only to see him jump into a limo parked at the curb and drive off. I went back inside to inquire what I’d just seen. The dealer was discreet, but told me the player likely had tables reserved all over town. “He’s likely looking for a hot table,” said the dealer. “Will he come back?” I asked. “Maybe. Maybe not,” said the dealer. Another guy was standing near me when I asked the dealer if he could tell me how much the man had gambled. “No, sorry,” said the dealer. The other observer told me, “I can tell you it was in excess of $100K.” I looked inquisitively at the dealer who simply made one nodding notion to affirm that it had been a 6-figure three spin play! No spin took more than 60 seconds. Within less than 5 minutes this high roller had lost over $100,000. Talk about something not working!! We went to grab dinner and a few hours later there was another dealer standing at the same table. There was the sign, “Reserved.” We walked around, keeping our eye on the table waiting to see of the high roller would return. He did. I moved in closer, maintaining a comfortable, anonymous distance. Same result as the first time. Same numbers and colors appeared to be played. I surmised that based on the pattern of where he placed the chips each time. Exact same movement and location, best I could tell. Three spins and off he went, catching his limo to continue his quest for a hot table. I assumed he hadn’t found it else he’d stay put. Or maybe he had found it and it went cold. No matter. In the span of less than 10 minutes total I had seen a guy drop a quarter of a million bucks. I started calculating how long it might take to drive from one casino to another. And how much time he spent at a table where he lost. Surely he’s winning somewhere, I thought. I mean, even filthy rich folks could ill afford to lose $25,000 a minute. He couldn’t stop playing because he was likely thinking more about winning than losing. It wasn’t an opportunity to stop losing. Rather, it was an opportunity to never win. I don’t know how much money he had to lose, but I know he could have used a lot more sense. Most of us don’t have money to lose, or sense. We need all we can get. Give Up. Move On. Quit. Do Something Else. This Ain’t Workin. Maybe It Never Will. We’re a hockey kinda family. My son, now 34, has played all his life. Me? I’ve coached, run leagues and done more than my share of volunteer work. Once I even served as the South Central Zone Coordinator for USA Hockey Inline and was on the rules committee. So, yeah, we’re kinda ate up with hockey. Well, when you watch hockey at the highest level, the NHL, you’ll see world-class skaters fall pretty regularly when they’re on the ice. Sure, they’re getting the snot knocked out of them when they do. Or maybe they’re being tripped (a penalty). But the point is, they’re not always upright. Quite often they fall down. But unless they’re injured, they hop up faster than most of us could get to our feet on dry land wearing sneakers. Getting knocked down isn’t a big deal. Staying down is. Last night I heard Bear Grylls say something on his new TV show, Running Wild With Bear Grylls. Tom Arnold was Bear’s adventure partner last night. Tom responded, “I get paid to look like an idiot.” But you don’t. So you’re afraid of looking like an idiot. Afraid of failing. Well, get over it. ‘Cause we’re all idiots at some point. Our idiocy can be fleeting or it can be sustained over time. Maybe we should all work harder to manage our moments of idiocy by either accepting them or embracing them. But you know what the real deal is, don’t you? Nobody is noticing your idiocy because they’re too concerned about their own. So go ahead. Fall down. Get back up. And act like nothing happened. I’m stepping away from things around here until after the Labor Day weekend. No, it’s not a vacation. It’s work. But don’t fret much because I’m going to be back with a vengeance, Lord willing. And the next time you hear me here (in the podcast), I’ll likely have rebranded some things. So I’m walking the walk in addition to talking the talk. I’m quitting one thing so I can start something else. Something better. Something bigger. In the meantime, I’m keeping the lights on over at Leaning Toward Wisdom. Things over there are working so I gotta keep it going while I figure things out around here.